The historic monument looks like it could burn to the ground. 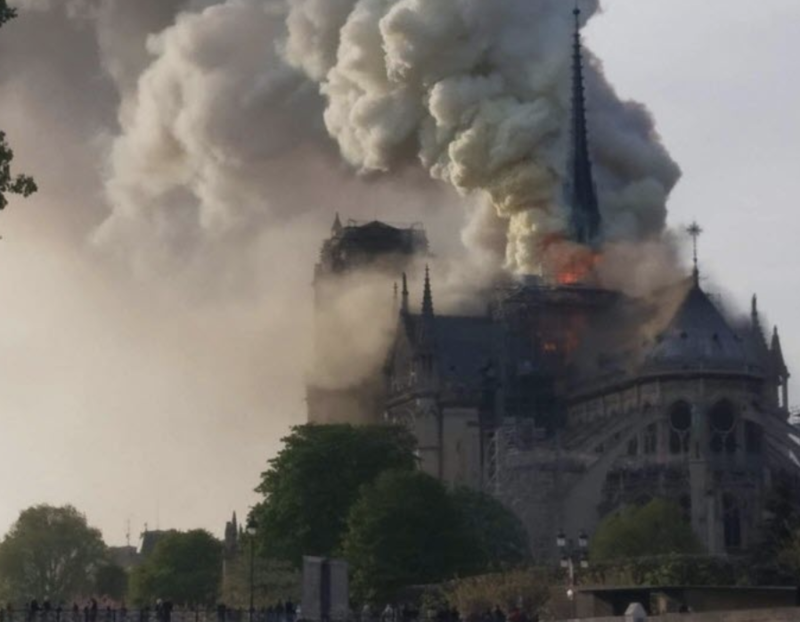 BREAKING NEWS: THE ROOF FROM THE NOTRE DAME CATHEDRAL HAS ENTIRELY COLLAPSED. 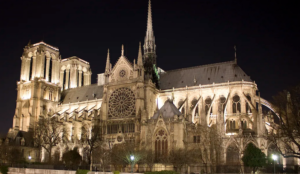 Spire partially collapses during fire at Notre Dame Cathedral. Devastating. Since officials are blaming the fire on an 'accident' related to the renovations...just imagine renovating one of the world's most historic landmarks then accidentally burning it to the ground. 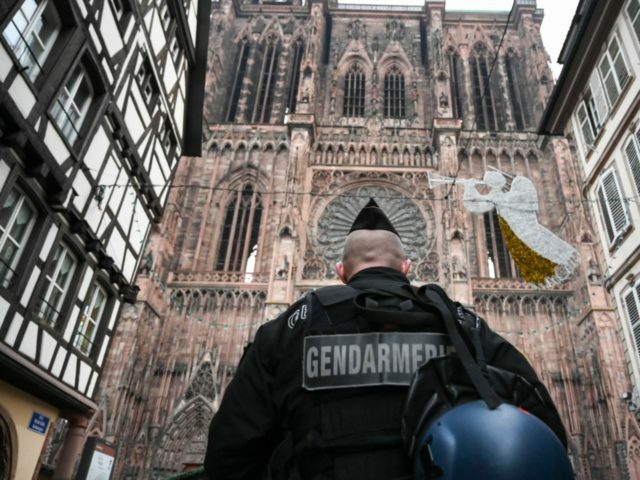 The neighborhood around the cathedral has been evacuated and Macron is reportedly on his way to the scene. Huge crowds have gathered around the site. At this point, firefighters attacking the blaze are treating it as an accident somehow related to the "massive" construction happening at the cathedral, which was being renovated. Police later confirmed that the fire was an accident linked to the renovation work. If there's a silver lining, many of the historic statues were removed by crane just last night. Meanwhile, the fact that the cathedral caught fire at the beginning of holy week, a time when catholic tourists have flocked to the city, added a layer of irony to the fire. At this point, it looks like the cathedral's spire has been totally destroyed. 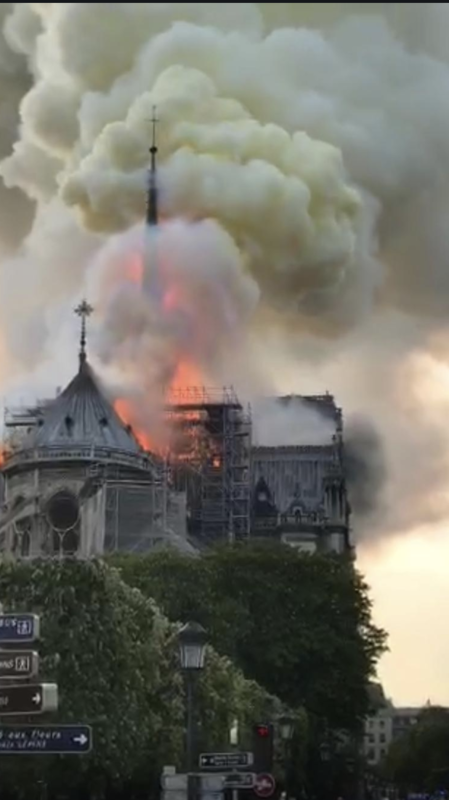 BREAKING NEWS UPDATE: The entire spire at the Notre Dame Cathedral in Paris, France is on fire. French President Emmanuel Macron has postponed a policy speech to attend to the disaster. 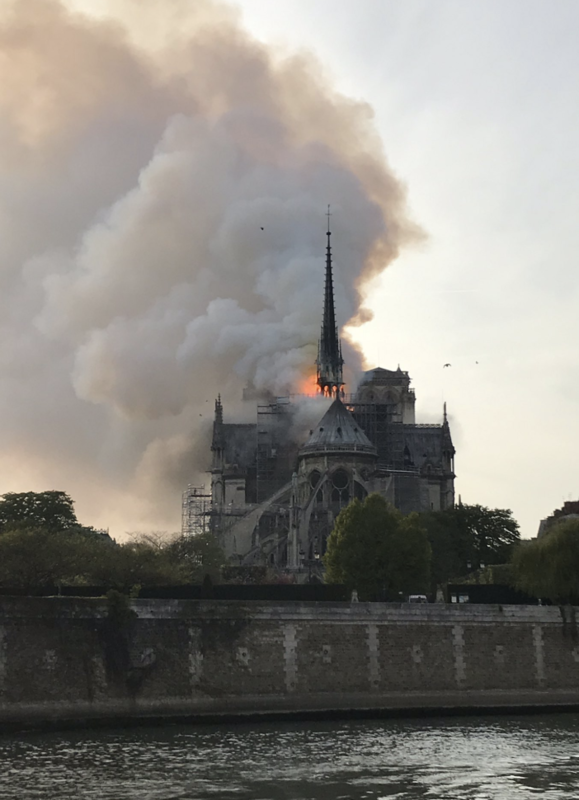 A spokesman for the cathedral said the fire began around 6:30 pm local time, or around 1:30 pm ET. 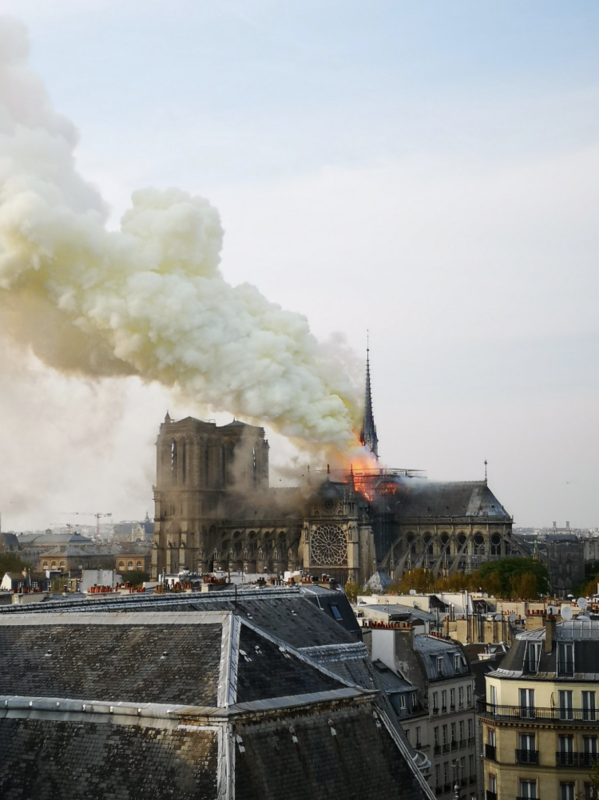 It's unclear how it started or what, exactly, is going on, but the historic Notre Dame cathedral caught fire on Monday, and photos and video circulating on social media suggest that conflagration has engulfed the historic monument. 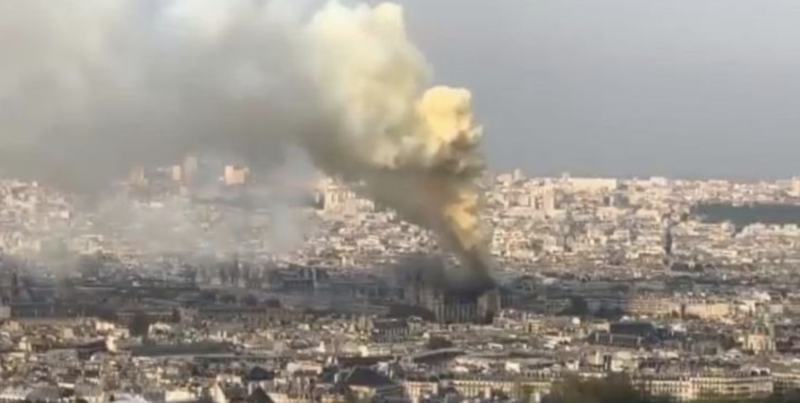 #Breaking: Local Witnesses on the ground are saying, the church is completely on fire and damages will be beyond repair at the iconic cathédrale Notre-Dame de #Paris church. #NotreDame #France. Notre Dame cathedral in Paris is burning and my heart is breaking. Awful. The cause of the fire at the 856-year-old cathedral isn't yet clear - though officials said it could be linked to renovation work. 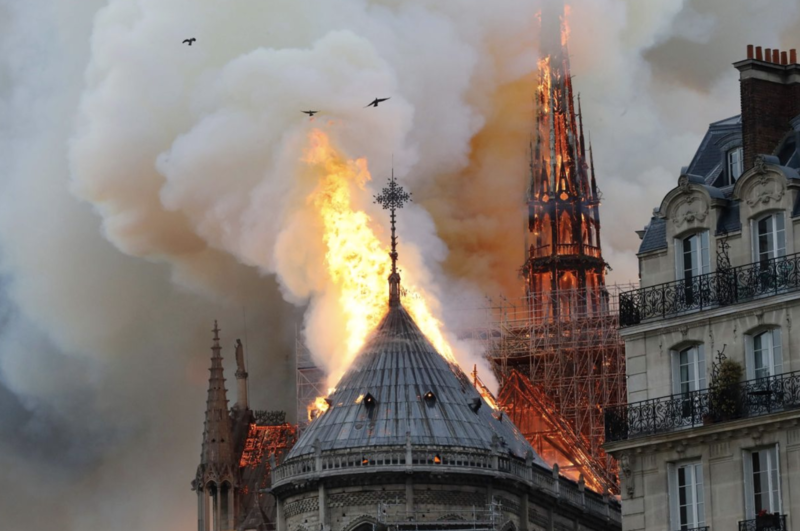 Parts of the roof and the cathedral's skyline-definiing spire were alight, though the true extent of the blaze was difficult to discern. Construction on the cathedral began in 1163 and was completed in 1260. Today, it is the most visited tourist attraction in Paris, drawing 12 million visitors per year, beating out the Eiffel Tower. The cathedral is considered the finest example of French Gothic architecture. 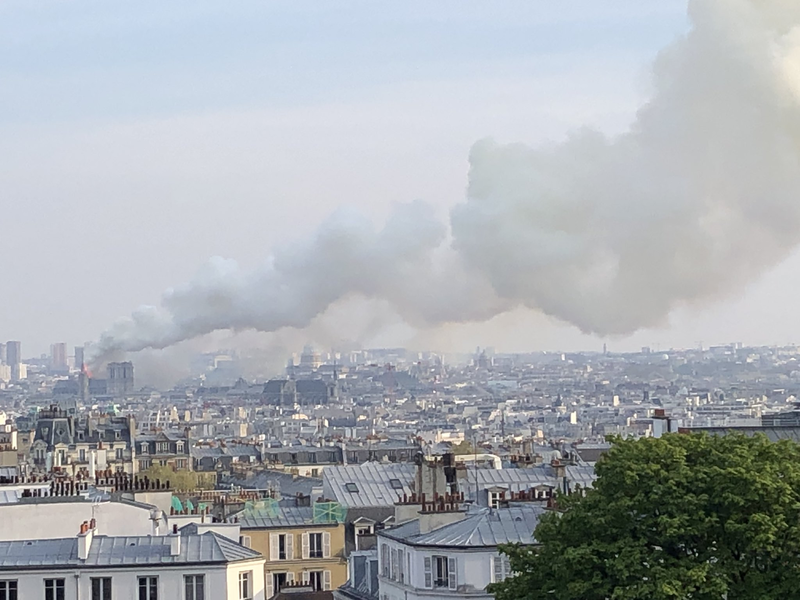 Paris Mayor Anne Hidalgo tweeted about the "terrible fire" and asked people to stay away: "A terrible fire is underway at Notre-Dame Cathedral in Paris. The @PompiersParis are trying to control the flames. We are mobilized on the spot in close connection with the @dioceseparis. I invite everyone to respect the security perimeter." The situation is a terrible tragedy as one of the most revered monuments in all of Catholicism looks like it could be completely destroyed, a historical tragedy that would be practically unrivaled in modern times. We think this calls for a little levity. UPDATE: This is not a post about the fire at Notre Dame. I scheduled this post hours ago, long before I knew of the fire. The story below comes from AFP; the fact that the target of the foiled jihad plot is now burning is coincidental. It would be “Islamophobic” not to admire Ines Madani’s wild romantic heart. After all, what says “love” more than blood spattered everywhere and broken bodies writhing in pain? Ines Madani, 22, was sentenced following a three-day trial during which she was accused of encouraging would-be jihadists to go to Syria and participate in attacks against France between March 2015 and June 2016…. She used different pseudonyms on social networks, pretending for example to be Abu Souleymane, a jihadist returned from Raqa to carry out attacks in France…. Madani’s lawyer, Laurent Pasquet-Marinacce, said her client, aged 18 at the time, was “a girl in search of recognition and love”…. An absolute tragedy for Western civilization. Tragic. An architectural and artistic beauty that has stood for hundreds of years. So much history, memories, many celebrations by Christians, others and part of western civilization. Last edited by GeorgiaPeach; 04-15-2019 at 08:57 PM. "We will rebuild Notre-Dame because that’s what the French people want. That’s what our history deserves, because that is our destiny."